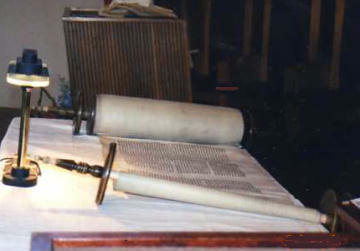 Join fellow congregants at lay lead Torah Study each Shabbat morning at 9:00 AM in the TBA library. All are welcome whether you are a regular or occasional participant. As has been said "Turn It Turn It Again and Again For Everything is in it" and each time we look at Torah we find new things. For more information contact Rhonda Hager or Kareen Hartwig. Torah Happens…even during the week! WANTED: Torah Studiers – No Experience Necessary. Each Thursday the weekly “mid-week” Torah Study group meets at Temple Brith Achim. From 12:00 p.m. to 1:00 p.m. Rabbi Lazar will facilitate a discussion about the weekly Torah Portion. Bring your questions, bring your answers, bring your lunch – we’ll provide beverages. Come early, stay late, schmooze with your “classmates” – the discussion will run from Noon to One. All are welcome (and encouraged!) to join us as we nourish our bodies and our souls…all at the same time. Beginners and Advanced Torah Scholars, alike, will all feel comfortable, as there is always something new to learn, and there is never a bad time to start!